oh how boring our Christmas was this year. And how much of a liar I am. The Christmas of 2015 was the craziest we have ever had. My eldest brother, the lucky guy, spent Christmas in Germany with his lovely wife to be, so he missed out on all the… Let’s just call it excitement. My day started quite late, since I had felt the dire need to finish my dream. It involved jumping through a city in one boot and exchanging this boot for another every 3 blocks, as well as a black-light party with ghosts. My subconscious found a very cool image on what a ghost looks like in black-light! They glow like a glowstick in various colours! 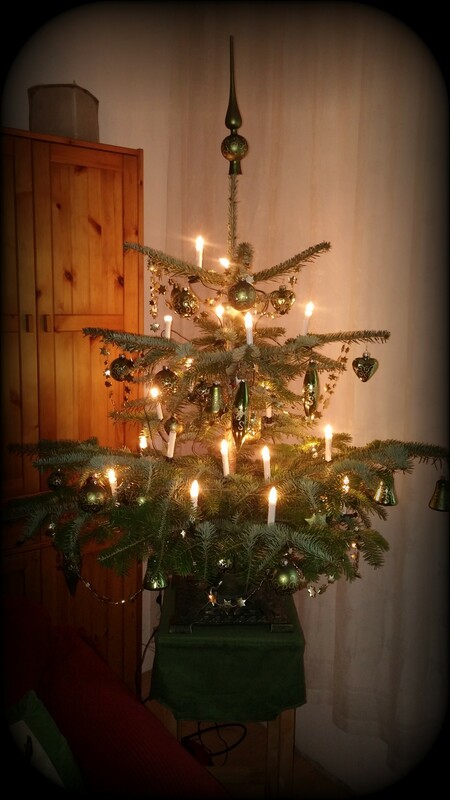 Anyways, my Mama and I felled a homegrown Christmas tree from our garden and then decorated it. We even managed to get the golden, star garland just right. In our minds garlands always end up a disaster, but it was quite a success this year. As soon as we were done, we changed out of our pyjamas and headed straight into the city for some carrolling at my Grandmother’s. She was a bit on edge, I suppose Christmas is hard for her. She had us drink a glass of blackberry juice, showed us her apartment, sang us a song and an hour later we were off to her sister. There we sang some songs, had her play with my darling nephew, then she gave us some presents, apologizing, as always, that she could „only give us so little“ (it’s a lot she’s always giving us, but she genuinely feels bad about it) and off we were again. Once home, some passersby told us there seemed to be a dying bunny in our garden. We thought not much of it, our bunnies are healthy as a horse, they just love lazing about, but my Mama went outside to check on them. She came back inside with a dying bunny. We laid our dear Linux on a towel and watched him breathe his last breaths. When my Mama stroked his head, his eyes shut and remained closed. And he was gone. We all cried and had my Papa give him a priesthood blessing to make sure he passes over well. In this blessing he explained how much we’ll miss him and how glad we were that he was part of the family. He was about 9 years old, but in my mind he was still only 3 or 4. After we had relatively calmed ourselves, we started our traditional Christmas eve. Up to this point I had drunk 3 glasses of water and eaten nothing. Hunger was slowly calling for my attention. I attached strips of paper with various characters from the Christmas story drawn on them to my family’s feet. My father’s right foot was King Herodes, my brother’s was the Shepherds, my sister’s foot was Mary and her arm was Baby Jesus. My Papa started reading the story and whenever a person was mentioned, they had to raise their foot. It was a quite amusing dance for sitting down. A musical number by my parents, a Star Wars version of Christ’s birth, a foto album and a thought on what Christmas means to us later, we started on presents. In the midst of which arrived my brother’s ex wife. The divorce a year ago was not a pleasant time for any of us and – since I’m being honest in this blog – it felt very intrusive to me. I try being a welcoming person that shows love to all, but I failed tonight. She was really nice to all of us, trying her best to apologize and pick up the loose and broken strands of a relationship to our family. But some things are best not mended on Christmas Eve. And so I did one of two possible human reactions. I fled. Christmas ain’t much a time to do fighting anyways. After she was gone, I was still on edge and it took me some time to.. Let go of my anxieties. But I felt all the more grateful for my wonderful family. I am grateful that we have each other. I love each member of my family and each add-on (my brother in law, nephew and future sister in law) are great additions and I love all dearly. I know that drama may come and drama may shake our family tree, but our roots are strong and our soil is our heavenly father. We build on our faith and we’re all the stronger for it. I have a greater appreciation for my loved ones and all I have, because I have Christ. And I know that Christ is currently taking care of my bunny.